CUCUTA, Colombia—Israel and Australia on Jan. 27 joined a growing list of countries pledging their support for Juan Guaidó, Venezuela’s opposition leader. At the same time, socialist dictator Nicolas Maduro oversaw a military display to showcase his forces’ loyalty to him in the face of an international ultimatum for democratic elections. Guaidó, who proclaimed himself acting president Jan. 23, quickly gained the official support of the United States, Canada, and almost every Latin American country. On Jan. 27, he called for Venezuelans to again take to the streets as pressure surrounding Maduro’s presidency—widely dubbed as illegitimate—intensified. Maduro, 56, is now facing the biggest threat to his presidency since he first rose to power in 2013. Socialist policies and rampant corruption in Venezuela, along with Maduro’s handling of the economy and widespread human-rights abuses have crippled the oil-rich nation. 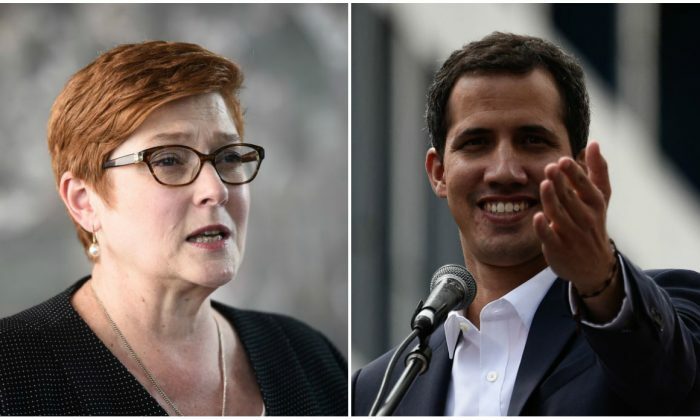 “Australia recognizes and supports the President of the National Assembly, Juan Guaidó, in assuming the position of interim president, in accordance with the Venezuelan constitution and until elections are held,” Australia Foreign Minister Marise Payne said in a statement. Israel’s recognition of Guaidó as president comes after the Trump administration requested their support, according to Axios. 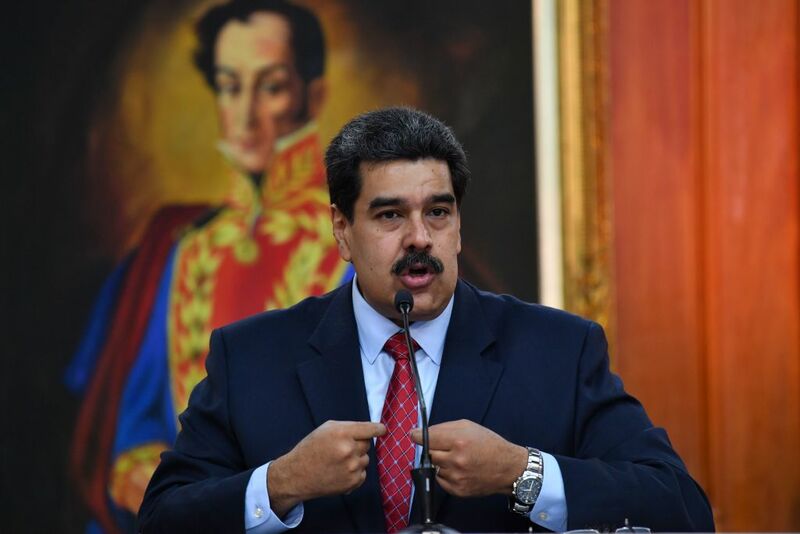 “Israel joins the United States, Canada, most of the countries of Latin America and countries in Europe in recognizing the new leadership in Venezuela,” Prime Minister Benjamin Netanyahu said in a video message. President Donald Trump, meanwhile, on Jan. 28 signed an executive order on “Taking Additional Steps to Address the National Emergency with Respect to Venezuela.” Trump ordered further steps in tackling human-rights violations in Venezuela that include arbitrary arrests, detention of anti-Maduro protestors, curtailment of press freedom, and harassment of political opponents. The Trump administration announced on the same day the sanctioning of Venezuela’s state-owned oil firm, Petroleos de Venezuela, S.A. (PdVSA). The Treasury Department said the firm has long been a vehicle for corruption for Venezuelan officials and businessmen. “Today’s designation of PdVSA will help prevent further diverting of Venezuela’s assets by Maduro and preserve these assets for the people of Venezuela,” Secretary of the Treasury Steven Mnuchin said in a statement. Maduro, alongside Defense Minister Vladimir Padrino, on Jan. 27 watched a platoon of soldiers using Russian hardware unleash volleys of rocket-propelled grenades, machine-gun anti-aircraft fire, and tank rounds at hillside targets. Maduro said the display showed the world he had the backing of the military and that Venezuela’s armed forces were “ready to defend the country,” according to Reuters. During that meeting, Secretary of State Mike Pompeo called out some of the countries supporting Maduro. 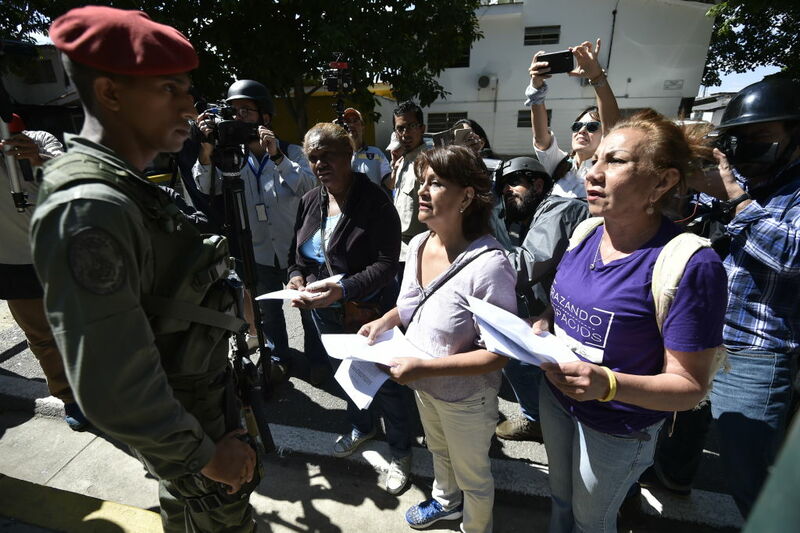 Guaidó, in the meantime, is offering amnesty to soldiers who join his side. Although there’s growing chatter that Maduro’s regime may soon end—and with it, Venezuela’s spiraling economic and political crisis—for now, the flow of people fleeing the country shows no sign of abating. The mass political demonstrations held Jan. 23 caused a temporary reduction in arrivals at the border crossing of Cúcuta, as Venezuela’s public transport system collapsed. 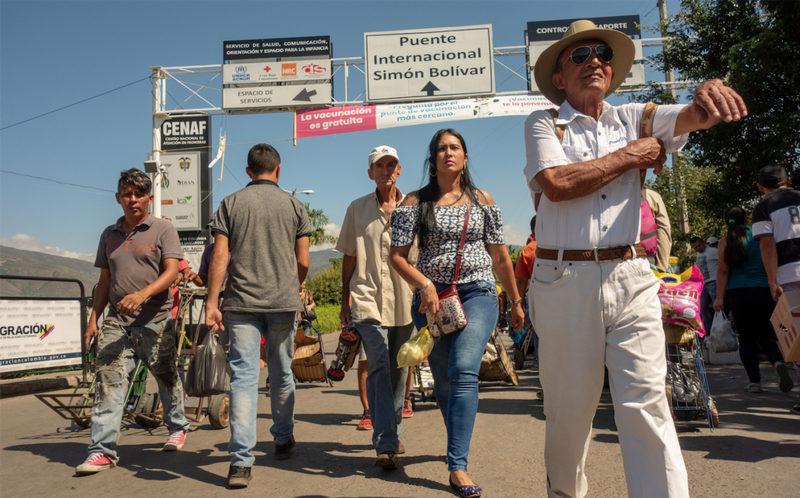 But by the following weekend, it was business as usual, with some 40,000 a day crossing the blisteringly hot Símon Bólivar bridge connecting Venezuela with eastern Colombia. Elba Montesinos, 20, and her 2-year-old cousin, Arantza, are two among those making the trip. They long to be at home in Barquisimeto in the western state of Lara but have been left with no choice but to leave for neighboring Colombia. “The situation in my country is unbearable. 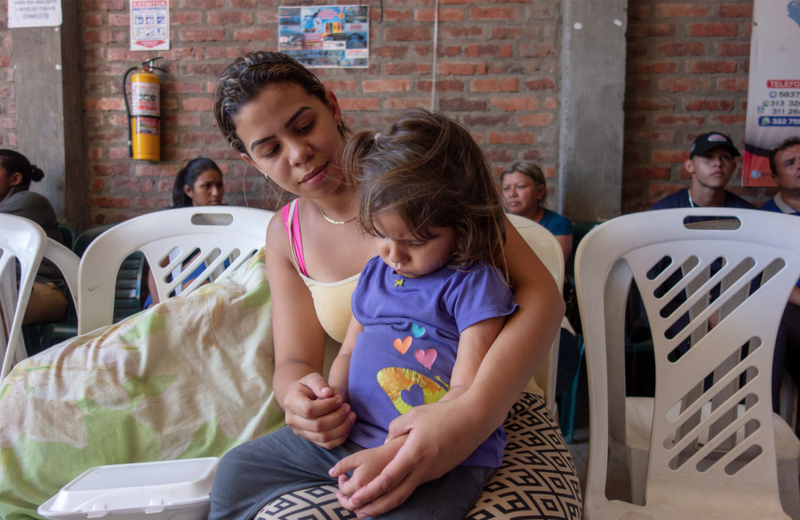 We can’t even wash our clothes because the detergent costs the minimum wage,” said Elba, sitting in an overcrowded bus shelter with Arantza perched on her lap. Elba was two years into a science degree in systems analysis that she hoped would help her secure a promising job, but, like many young Venezuelans, had to abandon her studies in order to eat. She has now left her parents—as have her four siblings—and is waiting to take the three-day bus trip to Guayaquil, an Ecuadorian port city where she hopes to find work. “We should be able to do all the things young people do—study, work, and enjoy life—but thanks to Maduro, we have to leave our country in order to subsist,” she laments. Under Maduro, conditions in the once-rich nation have deteriorated to the extent that three million—or 10 percent of the population—have had to flee, according to the latest United Nations figures. Those figures eclipse the Mediterranean refugee crisis and could soon reach those of Syria’s crisis. Untameable hyperinflation means wads of cash won’t even buy a loaf of bread, and where wages are sufficient to buy basic provisions, such goods are often unavailable. Nearly 90 percent of the population now live in poverty, according to the U.N.’s Economic Commission for Latin America and the Caribbean. An average of 40,000 people a day currently make the crossing from Tachíra, Venezuela, to Cúcuta, Colombia, said Rafael Eugenio, director of migration for the region. Another 12,000 go through illegal crossing points operated by armed gangs, according to Felipe Muñoz, the Colombian president’s chief adviser on the Colombian-Venezuelan border crisis. Most come to participate in Colombia’s burgeoning parallel economy, which has swelled to 10 times bigger than before the crisis took hold. Many Venezuelans cross the border to buy basic items that are unavailable or unaffordable in their own country. Others seek urgent health care from NGOs to combat diseases or malnutrition, which would otherwise kill them in Venezuela where hospital power cuts and medicine shortages are widespread. Those who can’t afford a bus or don’t have the necessary documentation undertake the grueling 370-mile trek to the capital, Bogotá, on a route controlled by armed groups. The cold of the Andes can be perilous for pregnant women or those with newborn children. Nevertheless, the route has become so popular that shelters are now inundated to the point of closure, according to Trisha Bury, deputy director of the International Rescue Committee in Cúcuta, one of a growing number of NGOs working to help those in need of humanitarian assistance. Despite increased international attention potentially helping NGOs to secure more funding to aid migrants, “I only see it getting worse before it gets better,” Bury predicts, owing to a continued decline in living conditions. Mass marches against Maduro and international recognition of Guaidó as the legitimate Venezuelan leader by most Western nations on Jan. 23 has sparked hope that Maduro could be on his way out, but the military appears to be standing firm, despite amnesties offered to them by the opposition to defect. 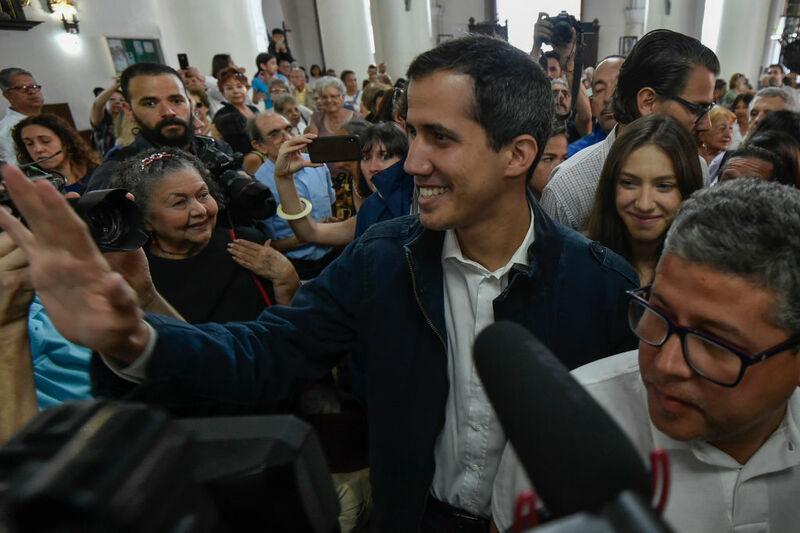 Many of those fleeing Venezuela still hold faith in the emergence of Guaidó, who was largely unknown until he became the figurehead that reunited Venezuela’s opposition just a few weeks ago in restoring democracy and prosperity. Although there has been a widespread international outcry against potential military intervention from the United States, many at the border who were forced to flee said they had no objection to foreign military intervention if necessary.